Ms. is an American feminist magazine founded by American feminist and activist Gloria Steinem, which first appeared in 1971 as an insert in New York magazine. The first stand-alone issue appeared in January 1972 with funding from New York editor Clay Felker. From July 1972 to 1987 it appeared on a monthly basis. During its heyday in the 1970s it enjoyed great popularity, but was not always able to reconcile its ideological concerns with commercial considerations. Since 2001, the magazine has been published by the Feminist Majority Foundation, based in Los Angeles and Arlington, Virginia. Annoyed by its slickness, I avoided Ms for a few months - just an intellectual GLAMOUR or MADEMOISELLE, I thought, the same ads' beckoning suave men to romance with a flawless skinned beauty, offering me Gloria Steinem and other free-swinging beauties as my new role models. Then I looked at the other issues. I was happy to read about women photographers and poets and historic feminist fighters, to read new works by Sylvia Plath and Doris Lessing, and to discover Simone de Beauvoir’s conversion to feminist political action. Ingrid Bengis' article "On Getting Angry" dealt so forcefully with our common experience of men's sexist attacks that I recommended it strongly to friends teaching women's liberation courses. The survival article on cars with its good drawings at last made my car a comprehensible machine. 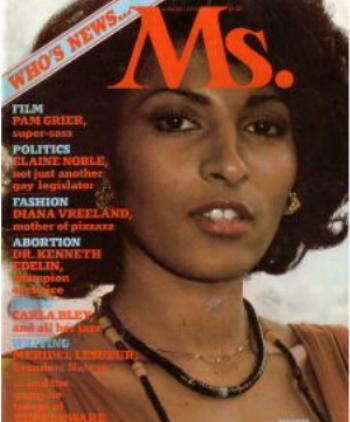 Furthermore, I knew a lot of other women who read Ms It is the national magazine of women's liberation available on newsstands everywhere, highly publicized, and eagerly read by nearly half a million women after only a few months of publication. All kinds of women read the magazine - high school students, college students, secretaries, factory workers, housewives, secretaries, social workers, actresses, writers, young women, older women. Women read it who sense things are wrong in their own lives, who know that women are on the move, that something's happening out there and they want to know what it is. Most are women who do not subscribe to movement magazines and newspapers, like WOMEN: A JOURNAL OF LIBERATION, OFF OUR BACKS, THE FEMINIST VOICE, or WOMANKIND. They read McCALLS, LADIES HOME JOURNAL REDBOOK, SEVENTEEN, COSMOPOLITAN, GLAMOUR, TRUE CONFESSIONS, and the other traditional popular women's magazines. It was clear that the women's movement had created a national market. There is profit in publishing a national women's liberation magazine. We have a high profile, more and more people are listening to us and in many areas we are becoming a force to be reckoned with. Ms national profile enables it to reach a wide audience. For many women it is among the first steps of identifying themselves with the women's liberation movement. Because it is an attractive, glossy magazine with good covers and graphics, the transition to reading a woman's magazine that is not devoted to glamour, style, and household beauty is not too difficult. WHY WELFARE AT THE BACK OF THE MAGAZINE? But, my old suspicions crept back to nag me as I read on. Why did Johnnie Tillman’s article on "Welfare Is a Woman's Issue" as well as “Three Lives in Appalachia" appear in the back of the magazine? Why did the articles on women, marriages, and families feature mostly white, middle-class professional people like doctors, social workers, lawyers, professors, ministers, and their wives? Why were the ads just like those in GLAMOUR and LIFE? What's so liberated about an article by two black professional women on how whites should talk to their black friends at cocktail parties? In many ways, Ms is a deceptive and dangerous magazine. While claiming to speak nationally for all women in women's liberation, Ms is clearly written by and for only part of the women in America, middle class women. As a commercial venture, dependent on profits, Ms will exist only as long as it makes money. In order to make that money, Ms makes certain limiting choices. First of all, Ms. costs a dollar, $1.00, each month. Right away, it costs more for poorer women than richer women, as $1.00 is a larger bite out of a salary of $89 a week, than out of $175 a week. The price reflects the magazine's commercial nature; it is a profit-making investment for some few people. Paid articles, glossy format and good graphics cost money. The high price also suggests that Ms is aimed at women with ample pocket money - not welfare or working women who have to stretch inadequate incomes far. If articles were contributed, rather than paid for, who would write for Ms? If the magazine were less glossy, who would read it? The high circulation of low-cost magazines like TV DIGEST, MODERN SCREEN, and WOMEN'S DAY suggests that it is not glossy format and expensively priced articles that draw readers. Rather, people buy a magazine that responds to a strong need - wanting to know the week's TV programs, curiosity about Hollywood gods and goddesses, and a supermarket low-cost women's magazine. The audience for a national women's liberation magazine has been proven, so we would like to see Ms adapt its style and format to lower cost. Yet, before Ms appeared, Gloria Steinem did promise that Ms would not publish sexist ads. When a woman wrote in to complain that the Coppertone ad with the bronze blonde in the white bikini was sexist, the Editor's Note said, "Read the ad copy. It speaks to 'people,' not women." Since when does the copy seal the product. "However," the Note continues, "there's disagreement about that ad in the office, too, especially concerning the model's 'pose.' Please continue to send us your reactions to the ads; we're forwarding your comments to the advertisers, as we promised." Come on, Ms how about you refusing to print sexist ads? FOR AND BY COLLEGE-EDUCATED WOMEN? Thirdly, I noticed that the articles are usually written about and by individual, middle class, college educated women - "Have One, Adopt One," "Anatomy of an Affair," "Rosalyn Drexler Fights her Fat," and "The Housewives' Moment of Truth, " to name a few. The article “Why Women Fear Success," while an interesting commentary, is itself based on a study done of undergraduates at the University of Michigan. The article about fan magazines is not written for women who regularly read those magazines to show how their sensational lies feed on women's boredom and loneliness. Ms. does not speak to the lives of housewives, married young with three small kids, a marriage gone sour, and dim, dull job prospects. It does not deal with the daily lives of waitresses and factory worker. "The Song of the Shirt", about women garment workers, is a historical article discussing the conditions in 1867, not present day America. The implied snobbery of the magazine maintains and continues the elitism of America's class society. All women are not born equal. 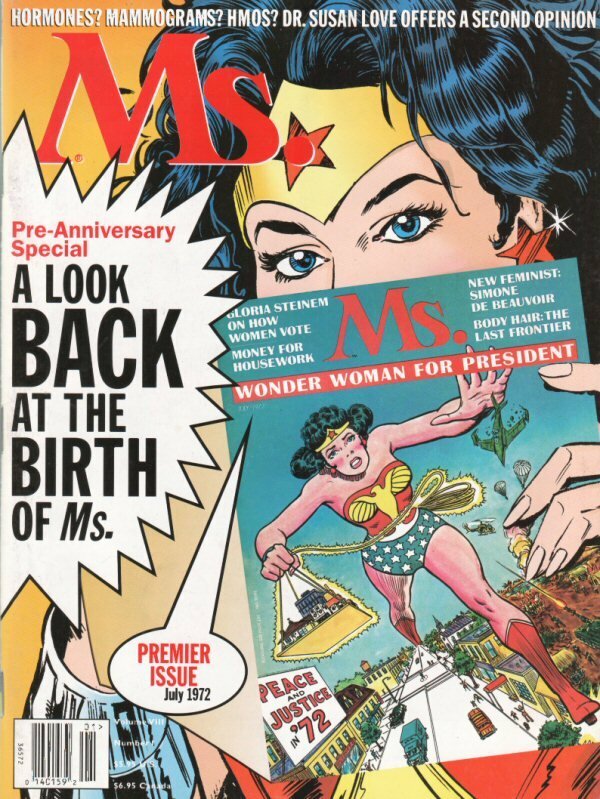 Ms is dangerous in that it gives many women a double message -"Join with us at Ms to be a liberated women," but also "You can't be like us because you didn't go to college, and we put you in the back of the magazine to prove it." There is a kind of intellectual bias in the magazine that suggests the writers and editors all went to college. The vocabulary in the article would send a lot of readers to the dictionary, or else into a pit of self-doubt, once a gain reminded of their "stupidity" for not knowing a work. In fact, knowing that word's meaning is a fringe benefit of the class privilege of a college education, not an individual act of smarts. Another choice Ms has made is to walk a cautious line on lesbianism, featuring only an occasional article written by a prominent lesbian, for example, Jill Johnston's "The Return of the Amazon Mother" and "Lesbian Love and Sexuality" by Del Martin and Phyllis Lyon. Other articles take little notice of lesbian values, and imply that all women are heterosexual. A national magazine of women's liberation is here to stay it seems, and for the meantime we’ll continue to read Ms The letters to the editor are enjoyable to read and indicate a wide audience responding to the magazine. The articles, though limited, are on the whole well-written, lively, and interesting. Many are personal articles full of anecdotes out of the author's life, and they read as if the writer is talking to her readers. Ms avoids long, dull overly analytical articles, and at the same time tackles serious issues in depth. The many useful sections of the magazine include the articles on machines (cars, bikes, sewing machines), references to where to get films and literature mentioned in articles, a guide to where to get help from selected national women's groups, and a list of women's movement publications. The rest of the women's movement can use Ms as a forum for publishing its articles and ideas. While changing the aims and content of Ms is no priority item for radical women's organizations, we would like to see some changes - basically less appeal to college-educated middle class women, and broader appeal to all women. More articles about collective women's struggles. Feature women fighting in Ireland and North Vietnam, instead of portraying the women of Bangladesh as suffering victims. How about an article about a strike by nurses or telephone operators, as well as the article about the employees' class action suit against READER'S DIGEST for discrimination in employment (October, 1972). More articles about our common oppressive experiences, like "On Getting Angry." High school tracking, for instance, hits every woman in America. Early marriages confine working class and middle class women in motherhood before they have confidence and experience in their creative and working abilities. Articles on more typical women's jobs, such as waitress, secretary, nurse, saleswomen, and factory work. Attention to how other parts of our culture, such as TV, Hollywood, and rock’n’roll, oppress women in female stereotypes. If Ms really wants to liberate women in America, then our sisters at Ms have a responsibility to fight the myths and self-destruction that growing up in a sexist society has brought to all women, not to create a new journal that carries on half the lies while pretending to end them all.